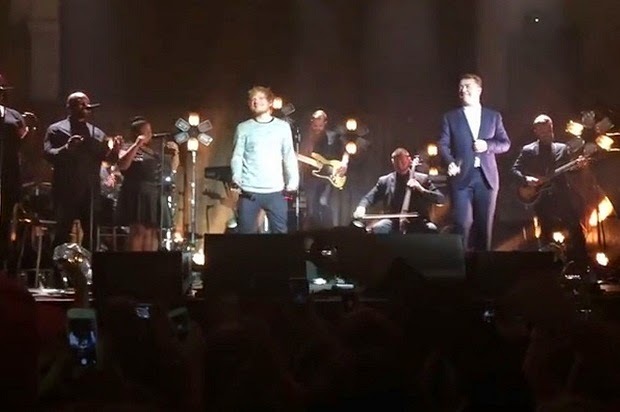 Performing at Albert Hall, Sam Smith was joined by Ed Sheeran on October 29 when Sam was singing “stay with me”. This was a huge amazement for the crowd as they least expected this to happen. Even more amazing is the fact that both are young talented guys who have recently been recognized as super stars and they both come from Britain. Not only did the crowd feel happy about it but many people in the crowd became emotional when they both sang together. Similar incidents have happened in the past but they ended up in an unwelcoming way where the actual performing singer wasn’t too happy about another artist’s sudden appearance. The case was quite different in this scenario. Both the artists seemed quite happy to perform with each other. They both already have a brotherly relationship and this can be told from the tweet that Sam Smith posted on Twitter right after his concert. He used some great words for his friend Ed Sheeran, calling him a true friend. He seemed quite happy to have Ed with him on the stage. The two guys really have a good friendship and they probably like to be in each other’s company. They both took the time to take a fanciful picture behind the stage with Tori Kelly. It can be said that some fans must have been expecting Ed to appear at any of Sam’s concerts since he had performed a cover of the song before. Both the artists are young and from the way they both sing the ballad it seems they felt the connection with this song. They are best friends and there is nothing more to prove about it. The fans should be happy to have two of their favorite artists on the stage at the same time. Many fans must be expecting a collaborative song appearing in the upcoming albums or other duo performances at concerts. Ed Sheeran was born in Hebden Bridge and is only 23 years old right now. Realizing the musical talent in him he had already moved to London in 2008 to grab whatever opportunities he could to become a musician. He has won several awards for his great talent and many of his songs have been nominated for Grammy Awards too. Sam Smith is just one year younger than Ed and he gained the real fame in 2012 and then in 2013. He’s also received many awards including the best single of the year for “la la la” from Mobo Awards.